Vice President Mike Pence has met with some of the contenders for the Supreme Court vacancy created by Justice Anthony Kennedy's retirement, The Associated Press has learned. President Donald Trump has spoken with seven potential candidates and is set to announce his decision on Monday. Trump has said he'll choose his nominee from a list of 25 candidates vetted by conservative groups. Top contenders include federal appeals judges Brett Kavanaugh, Raymond Kethledge, Amul Thapar and Amy Coney Barrett — all of whom spoke with Trump on Monday. News of Justice Anthony Kennedy's retirement is stoking arguments between Republicans, who are pushing to confirm a new justice by fall, and Democrats, who argue a vote should wait until after the November midterms. Kennedy was a key swing vote among the nine justices. Trump has also spoken with Thomas Hardiman, who has served with Trump's sister on the 3rd U.S. Circuit Court of Appeals in Philadelphia, according to a person familiar with the conversation who also was not authorized to publicly discuss it. The president spoke by phone with Republican Sen. Mike Lee of Utah on Monday. He's the only lawmaker on Trump's list. 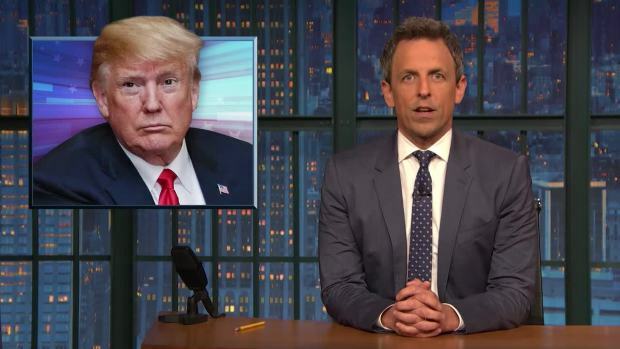 Seth Meyers takes a closer look at Republicans rushing to replace retiring Supreme Court Justice Anthony Kennedy while simultaneously working to stop the Russia investigation. Associated Press writers Zeke Miller and Marina Villeneuve contributed to this report.